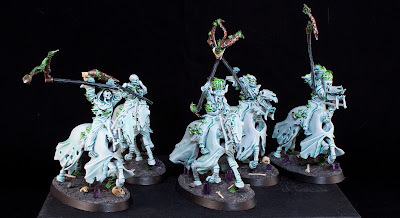 I was lucky enough to have started Nighthaunts almost a year ago because I liked the faction and they were quick to paint, and so I was in the perfect position when they got some awesome Allegiance Abilities. 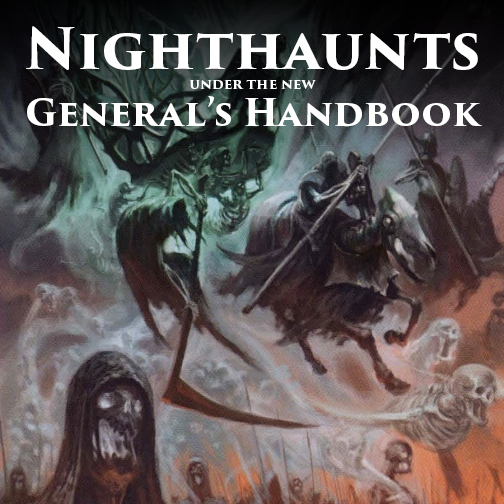 So how do Nighthaunts play under the new General's Handbook? To start things off let's take a look at their new Allegiance Abilities. Like every Death faction to get abilities, the Nighthaunts have their own version of the "Death save" called Deathless Spirits. This allows all Nighthaunt units to roll a dice whenever they suffer a mortal wound or regular wound if they are within 6" of a hero. On a 6+ they ignore the wound. It's pretty standard and something most people will be used to by now. The range has gone down from the 10" it was before, but it's not a huge deal and just requires you to play a little more tactically with your heroes. Their big ability though is Ethereal Rulers, which allows you to essentially call up a ton of your army from the Underworld during the course of the game. 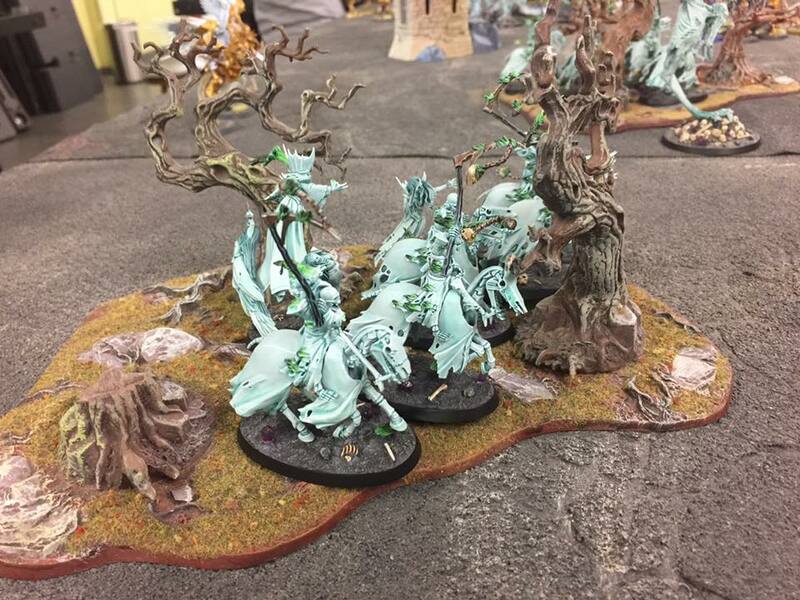 You can set any number of Nighthaunt units aside during deployment and say they are in the Underworld. At the start of each of your movement phases roll a dice for each unit set aside, and on a 3+ bring that unit on to the table anywhere as long as they are 9" away from an enemy. The only catch is that you must have at least one Tomb Banshee or Cairn Wraith on the table already to do this. This is an awesome ability, and is even better than the Stormcast one since you can choose whether you want to roll or not. That means if you're trying to keep that one unit in reserve until just the right moment later in the game, you can! You'll have to be careful though and make sure all of your Banshees and Wraiths don't get killed beforehand, otherwise you'll lose all of your units in reserve. I've already used this ability in several games and love the tactical flexibility it gives you. Bring some Spirit Hosts on later to grab objectives or have a Mourngul pop up in the middle of their army and watch as they scramble to deal with it. The last Allegiance Ability modifies the Black Coach so that it is powered up by Cairn Wraiths and Tomb Banshees instead of Death Wizards. This was more of a fix to the Black Coach than an ability, since previously it was very hard to get it to use any of its abilities in a pure Nighthaunt army. The only way you could get a wizard in was if you gave your general the command trait that made them a wizard. Now you don't have to worry about that anymore. The list of Command Traits for Nighthaunts has some of the basics like you would expect, adding 1 to their wounds or save roll, re-rolling hit rolls of 1, etc, but for me there were two stand outs. Terrifying Entity is the first one I took in my army, which makes all enemy units within 6" of the general -1 bravery. When you put this on a Banshee and have some other Banshees nearby your scream attacks are suddenly doing a lot more damage. To me, this just seemed like a lot of fun. I really enjoy using the Banshee's scream when it actually works, and knocking off the extra pip of bravery beforehand is just icing on the cake. 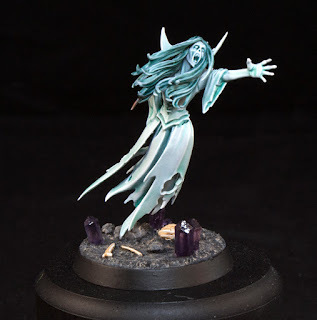 The one that most people will take though, and the one I am actually using for a local tournament, is Ruler of the Spirit Hosts. This allows you to re-roll your Ethereal Rulers rolls if you fail as long as the general is alive. There's nothing like having a little bit of extra insurance when bringing on your reserves. All of the artifacts are pretty cool too, with the standout for me being the Lightshard of the Harvest Moon. 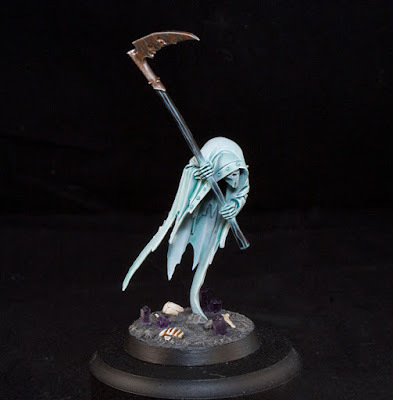 Besides having an awesome name, it also allows you to re-roll all failed hit rolls for all Nighthaunt units within 6" of the bearer once per game. This is spectacular for Spirit Hosts. Since you do mortal wounds on a 6 and hit on a 5, the majority of your hits that are not mortal wounds will be misses. This mean you'll be re-rolling a whole bucket load of dice and hopefully getting more mortal wounds out of it. I stick it on one of my Wraiths and send him in alongside my Spirit Hosts. Some other good ones which I will probably switch through in the future is the Midnight Tome, which makes your hero a wizard, and the Pendant of the Fell Wind. This allows you to add 3" to the movement of all Nighthaunt units within 6" of it at the start of the movement phase every turn. That's pretty speedy. Covetous Familiar is also a cool one, potentially adding in some extra mortal wounds and would fit my general pretty well. The rest are pretty decent as well. So how does this all effect my army and Nighthaunts in general? Well, suddenly everything has gotten a whole lot more maneuverable. The Ethereal Rulers ability gives you a ton of options for how you want to play your army. Personally I have been leaving just a few units in reserve, which I then pop on in the second or third turn. They can steal objectives, wreak havoc (the Mourngul), or at the very least, force your opponent to deal with a threat that's presumably not near your front lines, relieving a bit of the pressure on your main army. 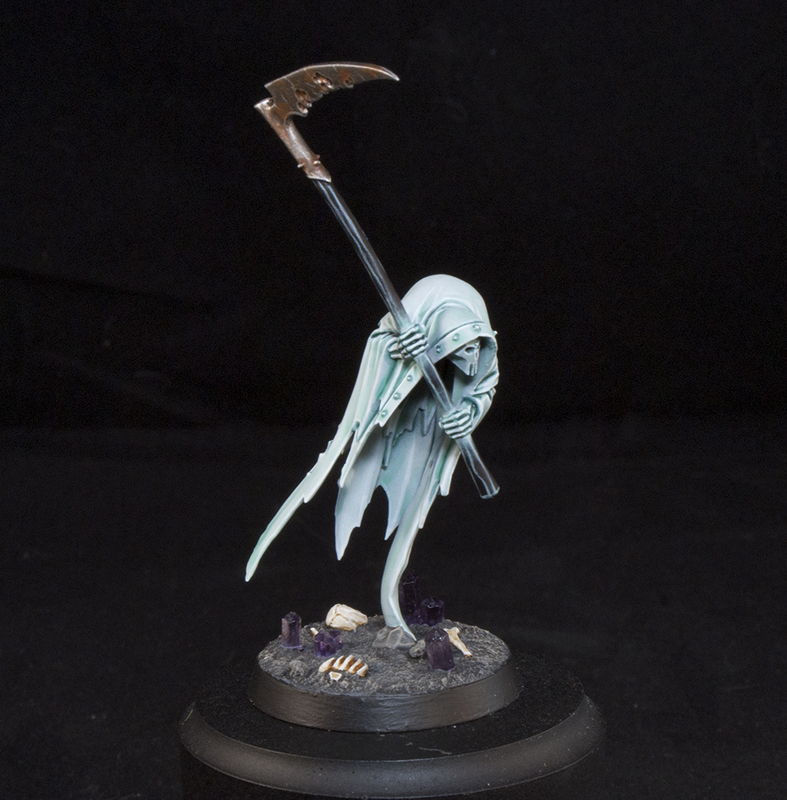 If you really wanted to you could even put more of your army in the Underworld, but just remember, you need to make sure one of your Wraiths or Banshees is alive to make use of it, and you also can only appear more than 9" away from an enemy model. This means if you leave your force too sparse to start with they could potentially kill all your 4 wound heroes, or space their army out in a way that would make it hard for you to come on. 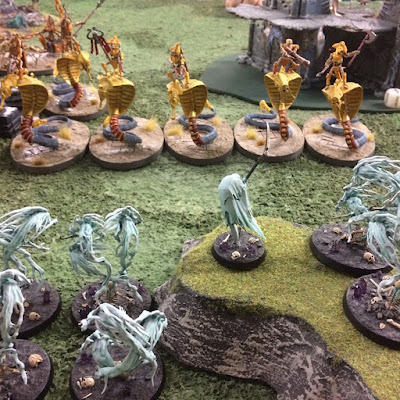 Hexwraiths are also now a Battleline choice, meaning you have two to pick from. I would still lean heavily on Spirit Hosts as your main unit, but I personally like Hexwraiths. They are fast, decent in combat, and usually underestimated since the Spirit Hosts are the main threat. They don't do a whole lot in my games, but they do enough, and that's what they're there for. 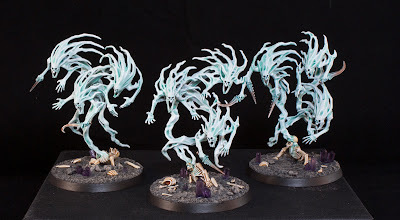 There could be some cool Hexwraith heavy army lists out there, but I haven't found one yet. 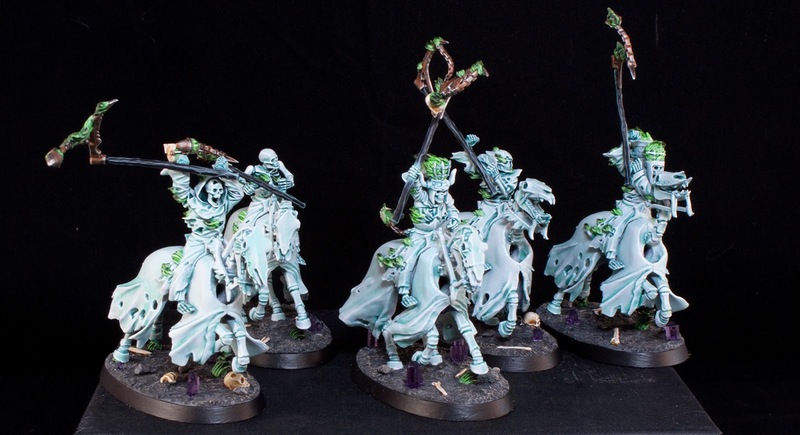 I would love to see someone play an army of mostly Hexwraiths though and do well with it. The new command traits and artifacts give Nighthaunts a little more punch in some places, and plenty of new flavorful options to build your army. I only wish we had a battalion choice so there was a way I could take a second artifact. 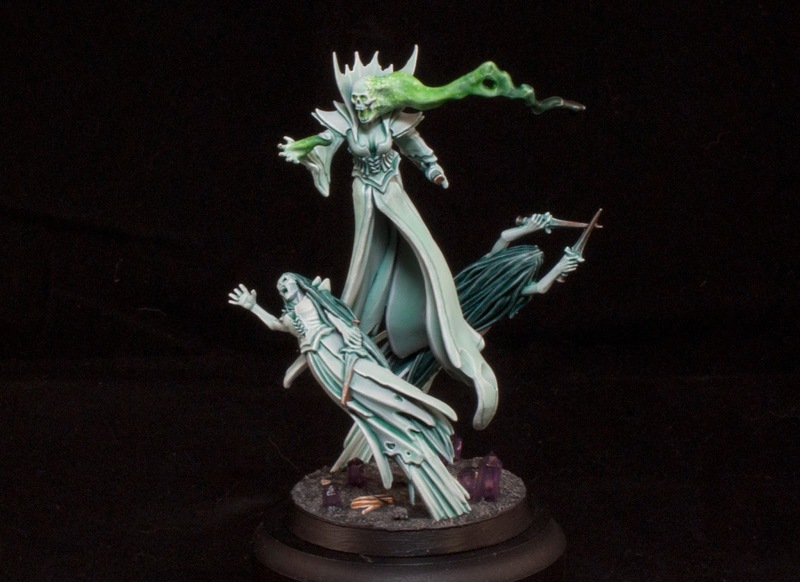 For allies Nighthaunts have the option of taking Deathlords and Soulblight. Some Blood Knights would be a nice choice, as well as a Vampire Lord to give you some magic. From Deathlords I would take Morghast and potentially Arkhan. Arkhan would definitely give you a ton of magical support, and it would look pretty cool to, having him lead an army of ghosts. Personally I will probably be adding a unit of Morghast Archai and a Vampire Lord into my army when I want to drop my second Mourngul. I think Nighthaunts came out on top with this update. The abilities they gained are pretty cool, and most importantly, a lot of fun to use. The idea of my ghosts rising up out of the ground, or forming out of the mists around my enemy's army is just to cool to ignore. I love that I can customize my heroes too, and all in all they feel like a full faction now. 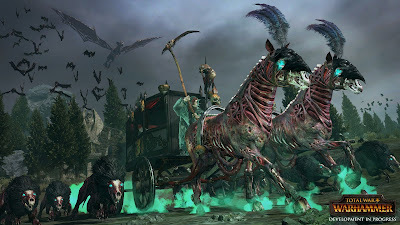 I think there are enough unit choices with the Tomb Banshee, Cairn Wraith, Black Coach, Spirit Hosts, Hexwraiths, and Mourngul, and the new abilities on top of all of that really cements them for me. I'm really excited to play some games with my new army. They already did pretty well in a one day tournament on the GHB's release weekend, and yesterday at another one day tournament they did okay, suffering a bit against a Snake/Settra list and my first time facing off against the new Seraphon. Now it's time to psyche them up for the Michigan GT coming up here in two weeks. I believe in you my little ghostly buddies. 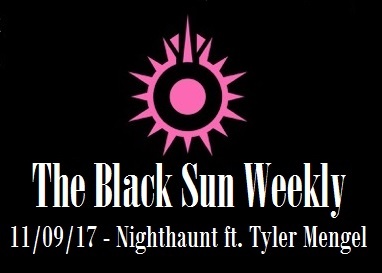 You can also listen to me talk more about his as well as other things on The Black Sun weekly with Chris here.